A window cable display, also known as a suspended wire sign, is the alluring and contemporary answer to ever changing signage. 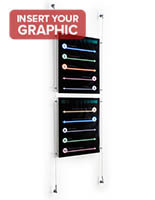 Acrylic poster holders and wall to wall mounting are what separates this unit from conventional signage. Other than banks and corporate offices, who generally uses window cable displays? This wall mounted system is often used by real estate agents and can be seen anyplace from retail shops to grocery stores, restaurants to community centers. In a single word the window cable display could be described as "versatile." Real estate agents might use this system to display every changing listings while local restaurants are able to grab passersby off the street with daily specials or posters for upcoming events. The window cable display can be sold as a single item or combined to form matrixes to accommodate any size advertisement. Each kit, no matter the combination, comes with a crystal clear acrylic panel, nylon coated wire and lightweight aluminum crafted wall and poster mounting hardware. The window cable display employs a satin silver finish on the mounts and edge grippers for a crisp and elegant feel. The entire system of wire suspended acrylic poster signs has been built to fit seamlessly into any contemporary business. Each retail setup has a low profile and will hang on any façade as well as being mounted above and below glass surfaces. A matrix system like this is often employed by real estate agents who want to draw attention to their listing with interchangeable posters of their ever changing commercial, retail and residential properties. What makes up the hanging poster system? The kit includes an acrylic sign holder which ranges in size from 18"w x 24"h to 22"w x 28"h for large eye catching advertisements. 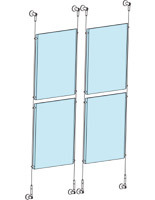 A window suspension kit has nylon coated, braided, stainless steel wire as its backbone. Each wall mount has a low profile and is elegant in design for integration into any retail store, produce market, school cafeteria, real estate agent office and community center. 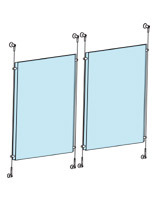 At the heart of the wall mounted system is the fold-over plastic panel which is clamped to the wire with satin silver edge grippers which match the mounting hardware. 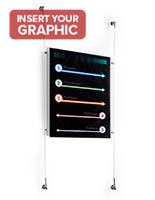 The wall mount sign is just one in a grand series of wire suspended signage that is offered in our online catalog. A mounted sign fixture is shipped with all of the necessary hardware so customers simply need a screwdriver and a poster! The only limitation of these wall-to-wall poster systems is the imagination of the user. The poster kits may be used with the larger 18" x 24" to 22" x 28" panels or combined with a plethora of other sized signs. With a complete customizable system, like the one offered here, a retail store could make diamond or pyramid shaped advertisements by cutting the wire kits to different heights or a school cafeteria could set up a wall to showcase breakfast and lunch options for the day, week or month! The cable window display is just about limitless in its applications. Why is this system better than conventional signage? Each wall rod system comes with a folded over piece of plastic which easily pulls back for simple insertion of eye catching graphics. This poster kit is comprised of thin wire, an acrylic panel and aluminum mounting hardware for an overall lightweight advertisement solution. The entire retail unit has such a simple design that it can be installed by anyone who can operate a screwdriver. Systems like this are unique for they mount with simple Phillips head screws and are able to be used over and over again! As mentioned above this wall mount sign is part of a much larger family of suspended matrix signs. Not only can the customer pair these large framed poster kits with different sized acrylic panels but each system may also be customized with individual components. These pieces include different sized wire, fixed and angled wall, ceiling and flour mounts as well as a diverse selection of plastic poster units which can house a single piece of 8-1/2" x 11" paper to four different sets of brochures. This advertising system is unmatched in its diversity and number of viable applications. Likewise due to the sleek and contemporary style of the acrylic poster system these wall-to-wall kits can be used by a diverse range of establishments and uses for a myriad of reasons. Schools may use this system at the classroom level to showcase changing assignments or in the cafeteria to exhibit lunch menus while real estate agents are able to highlight special listings and retail shops can make customers enlightened of up-coming sales. These thin, sleek wall mounted kits made from lightweight aluminum with acrylic panels are also great for the modern home. Like in any retail setting a suspend system like this can be mounted on any wall in the house to hang family photos or important paper documents. Imagine a wire matrix of colorful photos mounted in an ascending fashion on a staircase or a system of acrylic panels for each of the children or grandchildren in your family! Limitless are the options for this rod free poster system.